Subaru's 2017 WRX and WRX STI sports sedans deliver impressive performance on par with some of the best sports cars in the world, yet are priced within reach of the working class. The WRX's excellent safety score is bolstered by such cutting-edge technology as adaptive cruise control, collision avoidance and rear cross traffic and emergency braking. The Subaru blue is a very distinguished color. It is recognized by other drivers immediately! The WRX is a great buy. The performance of the vehicle is amazing. Gas consumption is more than fair and can fit almost any budget. The car has not had any mechanical issues to date. The car is comfortable in the front and back on short trips. Some of my passengers have complained about the room in the back after 3 hours of driving. The air conditioning could use more ventilation towards that back. The sound system could have had more work put into it considering the price of the car. However, the WRX is all about engine performance and you are getting every penny's worth. It is a fun reliable car that works great for a family or to just have fun in. I absolutely love this car it has been a great purchase an I will definitely purchase another wry in the future. The handling is fantastic. It is a very well built car with no outside noises or problems since I have had the car. I bought it brand new and already have 45, 000 miles on it and going strong. Fun sports car that everybody can afford! This is a great car that is a ton of fun to drive. It has great pick up and go but also feels safe. If you get street tires for the summer, get winter tires for the winter because street tires are unsafe for the winter. Handling does not decrease if you get winter tires. 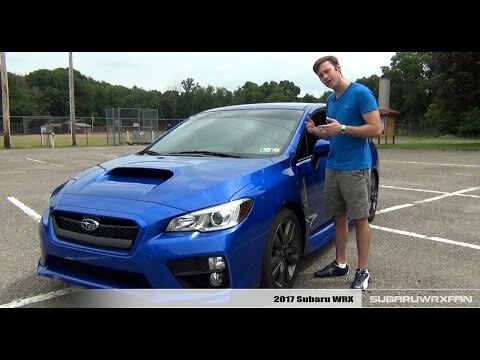 Here&#39;s Why the 2017 Subaru WRX is Absolutley AMAZING!